Despite the lowest rates in over 50 years, this attempt to recapture market share did not ease the plight of the two (former) mortgage giants, Freddie Mac and Fannie Mae or stop their dissent into the realm of penny stocks in July 2010. Riding in to capture that lost market share is the Federal Housing Administration (FHA). According to HUD, FHA mortgage loans are expected to increase 56 percent by the end of this year compared to 2009. During these uncertain times, smart real estate appraisers are increasing their odds for appraisal orders by increasing their knowledge of FHA requirements. Where should the appraiser reflect the observation of defective paint in an REO property built before 1978? When is no new fee due to the appraiser? May an appraisal be ordered by mortgage broker’s staff whose compensation is based on commission? Does FHA require appraiser independence? Can the effective date of appraisal be before the date of case number assignment? What is the time frame for the term and use of the appraisal? If you had to use the answer key below for one or more questions or are unsure of any of the new requirements, you can save yourself time, stress and liability with the recently updated FHA materials available from Working RE/OREP. The materials include the FHA Appraiser Inspection Checklist, the Checklist Instructions and the newly updated 101 page FHA eManual. This material is the fastest, most cost-effective, pain-free way to improve your appraising and your bottom line: the FHA Checklist, Checklist Instructions and eManual is just updated with 23 pages of new material added! The update includes the following topics, among others: REO appraisals, property deficiencies, complying with the competency rule, addressing declining markets, payment of fees (Appraiser, AMC, Lender), lender and appraiser independence and third parties (including Appraiser Management Companies). Updates are sent free for one year after purchase. These FHA materials work together to decrease the time and liability involved with FHA appraisals, giving you more confidence and peace of mind during the loan process and; more time to spend with loved ones doing the things you love, to concentrate on more important items such as growing and diversify your business. This course provides you confidence and peace of mind during the FHA appraisal process. Do yourself a favor and purchase the FHA materials today! The price is $49 ($40 for OREP members). Once purchased, the FHA Inspection Checklist, Checklist Instructions and eManual will arrive within one business day via e-mail in PDF format. Periodic updates are included free for one year from the date of purchase. 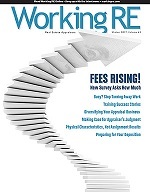 Please visit WorkingRE.com, FHA Inspections Course, Checklist and eManual. Lore DeAstra, MBA, SRA, CDEI, ACB has been involved in the real estate industry for over 22 years as a commercial and residential real estate appraiser, consultant, instructor, investor, Realtor®, and property manager. She has contributed numerous articles and authored courses for appraisers and Realtors® and has taught nationwide. Answer Key: 1) Page 1 on the Fannie Mae Form 1004; 2) When borrower requests the case be transferred to a new lender; 3) No; 4) Yes; 5) No (however, there are exceptions); 6) 120 days.